. إن Tradewinds McLeod Holiday Apartments حريص على توفير الراحة للنزلاء، فلا يوفر الموظفون جهداً في تقديم أفضل الخدمات وضمان حسن الاستقبال. يقدم العقار واي فاي مجاني في جميع الغرف, مطبخ, تسجيل وصول/خروج سريع, تخزين الأمتعة, واي فاي في المناطق العامة لضمان الراحة القصوى لضيوفه. يمكن للنزلاء الاختيار من ضمن مجموعة من الغرف المصممة بعناية لتعكس جواً من الراحة، والتي يتجاوز عددها 32. إن مسار جولف - ضمن 3 كم, حمام سباحة خارجي, حديقة هو المكان الأمثل في الفندق للاسترخاء وتفريغ طاقتك بعد نهار طويل. إن كنت تتطلع إلى إقامة مريحة وهادئة في المدينة، فستجد في Tradewinds McLeod Holiday Apartments بيتك الثاني. Thanks for your review. 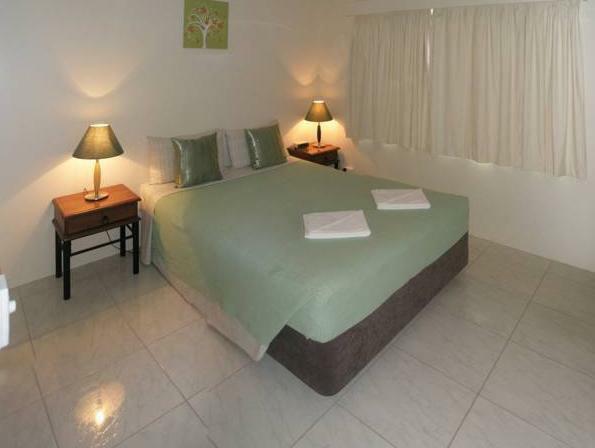 Yes we are basic Self Contained apartments that suit the budget travellers who cannot afford or don't want the luxury all bells and whistles accommodation in the larger hotels. Glad you had a good stay and your group of 3 apartments of family had a great time with us. Sorry we were not as helpful as we could have been but over christmas to new year we are very low on staff and over worked as you could imagine. The apartment is basic, you have to pay for extra things (though not much). What I don't like is the location. Everyday you go on tours so it's not necessary to hire a car, but travelling between apartment to where the tours start costs lots of money (for several days of stay). It's better to stay near the lagoon/nightmarket. Thanks for reviewing your stay. We are glad you enjoyed the comfort of the apartments here and happy with the location. We have a lot of feedback about how well we are located on the fringe of the city out of the noise of the inner city living and partying and the large number of shops over the road make things easy for people. Air conditioning was hardly working, when I took the filters out they were all completely choked with dirt. In one room the air con may as well have been turned off as it was just blowing air. I had to tune the tv as some channels were not there, when I told reception they said ok we will get someone in on Monday one day after we left. Sorry about the bad experience with the aircon you had, this has been rectified now as it is part of the departure clean checklist for apartments to check aircon filters and clean if needed. With the aircons, we do find at times people have it set to fan only by mistake and blame the aircon. They are split system airconditioners that work very effectively and temperature issues are normally user problems. Glad you got the TV working ok, sorry you had to tune it yourself, maybe someone previous was playing with it. the dates you stayed our maintenance worker was on annual leave and couldn't be fixed there and then like normal. Thanks for your great review. We are glad your family liked our swimming pool and apartments, we try our best to keep them all clean as we can. Brief but suitable. Rooms need basic attention and a good mopping would not go astray. Thanks for your feedback, this is something we needed to look into over the peak seasons where room changeovers happen quickly. We have recently in April 2017 started using more cleaners so they do not have to rush as much to get the rooms cleaned in the short changeover period, so the cleanliness should now improve. We are glad you liked our large pool and our quiet city fringe location. Good location but noisy at night with road next to our room.Staff a bit spaced out and not very helpful. This place is good for families especially if you have a car as it is close to everything and relatively quiet at night. We did not hire a car until the third day as we tried walking to the City Centre and the Esplanade, which took less than 30 mins with our easy stroll. not really impressed... nothing special. if you get wifi, the code will only work on one device. then you need to buy more wifi time. not happy with this, especially if there are more than one person staying in the room. 25 dollar return cab ride into the city. funny smell every now and then. pool area was nice though. location around the hotel wasn't very pleasant. some shady characters lurking around. Well equipped kitchen. 2 good size bedrooms and variety of channels available on the televison. 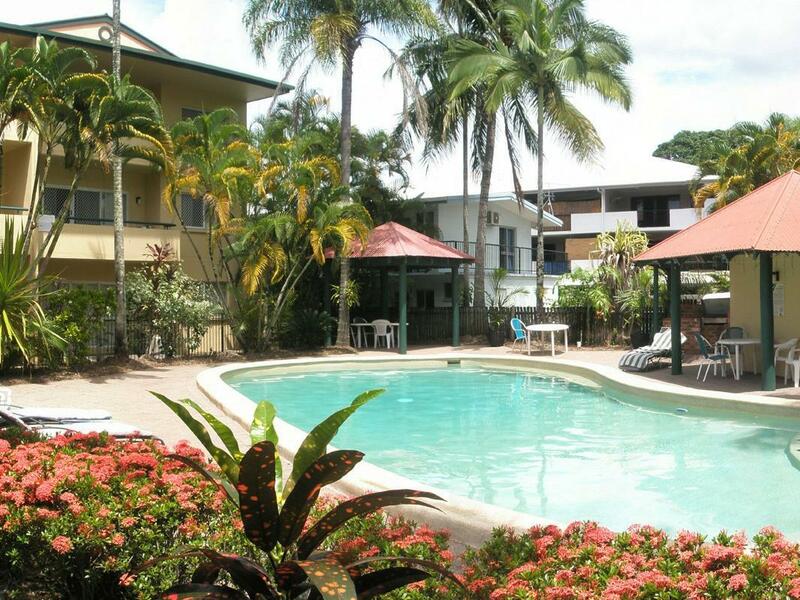 good basic accommodation, ideal for families and as a base for exploring cairns city. the kitchen was well equipped with everything you would need to prepare all your meals. apartment had a washing machine and dryer in the bathroom, which was a great advantage. the tv was good and had austar channels too, which was great. there was a nasty musky smell permeating throughout the apartment. we ran the fans and aircon whilst in the property which seemed to help a little bit. but entering the apartments after being out all day, we were not greeted with a pleasant smell. the furnishings were quite old and tired, and could do with a revamp. it was about a 20 minute walk into the city. 5 minute walk to the esplanade.